Psalmist I Am – Live through the many emotions of a follower, it’s OK! The format of each chapter is arranged in a manner that encourages pursuing a reflective reading pace through the use of various font sizes and topical side bars with descriptive sub titles and interesting visual illustrations. Each thematic chapter is provides the reader with guidance into the art of capturing their thoughts similar to the Psalmist in journal form. Ray gives suggestions for applications in subjects of: Praise and worship, prayer, God’s promises, following Him, and salvation in Christ. “Psalmist I Am – Live through the many emotions of a follower, it’s OK!” is ideal for personal devotions and study, easily adaptable for group study, or one on one mentoring. God Talks to Ordinary People – Are You Listening? “Saved by Angels” is Bruce Van Natta’s story of God’s intervention his life through a visitation of angels when a logging truck he was repairing fell off its jack and pinned him under the front axle. I was captivated by Bruce’s amazing and miraculous testimony; and deeply moved by God’s call on his life when I read his book in 2008. Bruce continues to demonstrate how the Lord uses ordinary people to carry out his purposes in everyday occurrences. This expanded edition of “Saved by Angels” includes study questions for reflection and personal application. The book is designed to be used as a tool to record or describe those times when God has spoken to you through his word, audible or the written; answered prayer; other people; dreams and visions; angels; life circumstances, and the inner whisper of the Holy Spirit. A DVD accompanies the book. “Your Turn” exercises at the end of each chapter offer a chance “keep track” that is for the reader to note personal incidents in their own lives that relate to the material discussed in the chapter. “Saved by Angels” is written with the prayer that the reader will be inspired to pursue a deeper relationship with Jesus and incorporate these foundational truths into a lifestyle and spiritual journey that honor him. “The Prophetic Generation – Fearless and Uncompromising” is a clarion call to Christian’s today to participate in this vitally important end times prophetic generation. Dr. Tim Bagwell is known and highly respected internationally for his ministry as a prophetic evangelist. “The Prophetic Generation” reestablishes his calling as “a prophet calling out in the wilderness” to fulfill the mandate to proclaim the message of the gospel of Jesus as a part of this critical end-times generation. Through shared personal experiences and illustrative study and exposition of the scriptures Bagwell reveals an amazing depth of understanding and a gifted anointing of the teaching and prophetic gifts. The book is formatted in a reader friendly pattern of thematic headings within the chapters and additional subtitles, Biblical quotations, and features prophetic insights,with shaded highlights. I found the Think on This feature at the end of each chapter thought provoking, instructive, and relevant. The chapter end-notes are evidence of careful research and add credibility to the narrative. “The Prophetic Generation – Fearless and Uncompromising” is convincing and authoritative and demonstrates rare and unusual insight into communicating the scripture to an audience of readers at every level of their Christian walk. A complimentary copy of this book was provided for review purposes. I was not required to write a positive review. The opinions expressed are my own. Award winning authors Ron DiCianni and Lance Wubbles collaborate in this encouraging collection of insight and inspiration. “In The Wilderness: Finding God’s Strength When Your World Falls Apart” combines Biblical examples and real life stories which enable the reader to find help from others who have travelled through the adversity of a wilderness experience. Selections from the writings of Job, the Psalms, and other scriptures provide comfort in times of pain, confusion, and chaos; and give insight, resolution, and strength through the wilderness seasons. Heartrending stories of the loss of a newborn, the devastating news of a debilitating disease, and shipwreck reveal how the Lord turns pain, turmoil, and sorrow into personal growth, purpose, and compassion for others. Inspirational quotes from classic devotional writers Thomas a’ Kempis, Martin Luther, John Bunyan, Hannah Whitehall Smith, and other well-known writers, including, A. W. Tozer, Brennan Manning, C.S. Lewis, and Oswald Chambers inspire strength and encouragement in times of trauma, grief and uncertainty. Written with empathy and understanding “In the Wilderness: Finding God’s Strength When Your World Falls Apart” is an important source of comfort and empowerment for those experiencing trauma, grief, and suffering. The book is ideal for use in hospital visitation and provides comfort for those going through the pain, and the uncertainty of crippling illness. A complimentary copy of this book was provided for review purposes. I was not required to write a positive review. The opinions I have expressed are my own. “Dr. 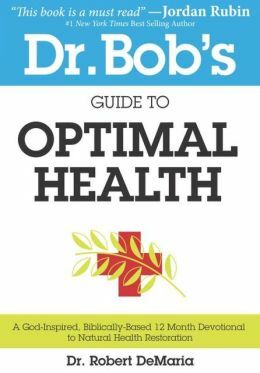 Bob’s Guide to Optimal Health” is a compilation of practical guidelines and life changing health tips designed to help the reader attain and maintain optimal health. This updated and expanded edition of Dr. Robert DeMaria’s invites the reader to begin a Biblically based twelve month devotional journey to natural restorative health and wellbeing. The devotionals are well organized and are made up of 21 day thematic patterns. Each day includes a carefully selected Bible passage or principle for reading and meditation as well as a practical pointer or tip considered a “Natural Prescription for Health.” These tips are made up of common sense applications and proven medial results which apply specifically to the emphasized principles of the day. Another unique feature of the daily devotional is space for recording your personal thoughts, reflections, goals, or for journaling your feelings. I found the Natural Health Assessment questionnaire especially helpful. Dr. DeMaria’s research is thorough, well documented, and rich in references for further reading and study. “Dr. Bob’s Guide to Optimal Health” is packed with important guidelines for becoming good stewards of our body, and empowers the reader to make important and necessary changes essential to attaining and maintaining optimal health. Spiritual life coach Carlene B. Charlemagne has designed a program to help the reader develop a spiritual mindset as they focus on the book of Proverbs. Her book “31 Day Spiritual Mindset Makeover” captures the essence of this Old Testament book of wisdom. The book is made up of thirty-one individual daily readings, which focus on a chapter from the book of Proverbs, a selected thought provoking verse from the passage which draws attention to a spiritual truth and leads to personal examination, reflection, and implications for personal application. The “Today’s Spiritual Mindset” portion includes a journal section and an ends with action plan. Charlemagne coaches the reader in using a system of journaling to: Develop personal goals, empower positive affirmations, change attitudes, organize priorities, evaluate success, and guide you on step by step on your spiritual journey. A 365 day Bible reading plan is included which encourages reading the complete Bible over the period of the year. “31 Day Spiritual Mindset Makeover – A Journey through the Book of Proverbs” is for everyone who is serious about finding and living out God’s plan and purpose for their life. Todd R. Weaver invites his reader to experience with him a new way of living. Todd relates the story of his own journey of faith, of moving from the thinking of the world’s system and its keys to success to enter into experiencing a tangible evidence of God in his life and the principle that right believing leads to right living. This is a book that will challenge you to change your life by changing your thinking, incorporating supernatural keys to achieving personal fulfillment and a higher quality of life through kingdom living. Weaver’s writing has an engaging with an even flow that moves quickly through principles he has adapted from David Ramsey on debt free living, from Joseph on kingdom living, and from Gary and Drenda Keesee and the Faith Life Church on the abundance of God’s grace. Todd puts a strong emphasis on the Gospel message and on accepting God’s gift of salvation in Jesus, on incorporating Biblical Truths into our daily Christian walk and Christian character. “Overflowing Success” is written for those willing to commit themselves to making Kingdom living a reality in their lives. Todd Weaver writes with a balance of vision, faith, and action to move from a life of struggling to one of overflowing. “7 Men and the Secret of their Greatness” features short biographical sketches which highlight the lives of seven men who have demonstrated strength in their commitment to a cause, personal conviction, courage in crisis, and bravery in the face of battle. Metaxas has created inspiring positive role models represented by men in government, sports, and church leadership. These men have made significant contributions to social reform, breaking down racial barriers, and religious bias. Eric Metaxas writes with a passion which inspires his reader to pursue excellence, motivate patriotism, and in making right choices. This may not be the book for real history buffs, however it is suited perfectly for reading together as a part of your family night, included in home school reading assignments, and as a part of every church and Christian school library. “7 Men and the Secret of their Greatness” is widely endorsed by recognized leaders, is highly readable, and deeply moving. I am recommending it to my family and friends.